(Enjoy delicious Mediterranean style homemade food at this family-owned and run business. Around the Blue Lake at Jenolan Caves is a beautiful spot to enjoy your takeaway lunch while admiring the views). First up is the charming village of Leura. It's one of several villages in the Blue Mountains that perfectly captures the spirit of the region – fresh mountain air and stunning scenery. Its pretty, tree-lined main street is great for browsing through its many antique shops, art galleries and bookstores. Why not enjoy a delicious takeaway lunch from Loaves and the Dishes café. From Echo Point you’ll be treated to a view that is spectacular. This mountainous World Heritage region covers an area of up to 10,000 square kilometres and features dramatic cliffs, deep canyons and lush vegetation, particularly eucalypt. When first discovered by the European visitors, the Blue Mountains had already been home to the Gundungurra people for what is believed to be millions of years and evidence of their culture and spirituality can be found throughout the region. Also from Echo Point you can see the imposing Three Sisters. According to Aboriginal legend, this unusual rock formation represents three sisters who were turned to stone. They stand an incredible 922, 918 and 906 metres respectively and are an amazing sight as the sun shifts to cast magnificent colours across the rock face. Now you head to the Jenolan Caves via the stunning scenery of the Cliff Drive. On arrival you’ll meet your experienced Guide who will take you through the oldest known open cave system in the world. Known to the local Aboriginal people as ‘Binoomea’ (Dark Places), the Jenolan Cave system stretches over an enormous 40 kilometres of multilevel passages, many still undergoing explorations. There are nine caves open to visitors, all featuring amazing lighting, underground rivers and limestone formations. You’ll be captivated by Lucas Cave, the largest of the Jenolan Caves. Its chambers are simply incredible. The highest chamber, reaching 54 metres, is known as the Cathedral and, with its incredible acoustic capabilities, has provided the setting for many underground concerts. At certain times, Lucas Cave will be replaced with a visit to Imperial or Chifley Cave. Before heading back to the city, you simply must take in the beauty of the Blue Lake. 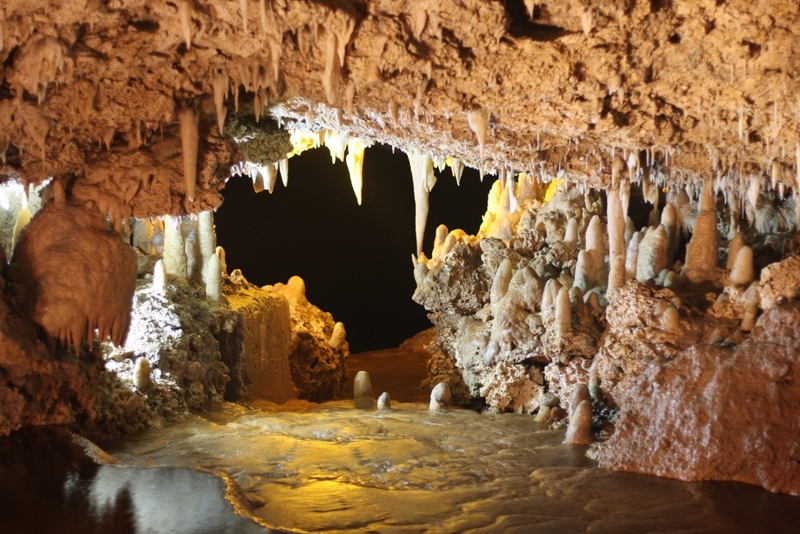 This gorgeous sight is the result of mineral laden water seeping through the limestone caves. When cast in sunlight, the lake takes on the most captivating vivid blue colour. Definitely a great photo opportunity! Departs: Sydney on Tuesday, Thursday & Saturday. Pick Up Starts from 7.00AM from Sydney Pick Up Points.